This game, as Scott Nicholson puts it, is the “granddaddies” of German board games. Speaking of Scott, he made this great video for learning Die Macher. I watched this twice in order to remind me of the game flow. He is really good at growing a beard and explaining games. Well worth the watch. Now, this six hour long game of political goodness is the reason why I write the crib notes. You don’t want to spend the time only to sit and look pretty on the sidelines. The good thing about this game though is the contribution cards. They allow you to get big injection of money and hopefully correct any first time mistakes. Be careful to leave some money for the opinion polls and media cubes in the first turn. Remember you only start with $25,000 and there will be few media cubes you want to place at $4,000 a hit. Money is good for shadow cabinet cards, media markers, meeting markers (campaigning), and secret bid for turn order. Keep these four areas in mind as you budget for the turn. Some turns you may want to conserve your resources and not compete all out. However, if you can get a few votes cheaply, it might be worth a few seats. So at minimal, try to dip your toe in every election, but pick the ones that your party policies match favorable to go all out. In addition to the point above, you never know what is going to happen. Someone may get an opinion poll that they cannot directly use, but instead hurt the leader and help you because your party policies match theirs more closely. Politics has its own calculus, so it better to participate at a low cost then not at all. Winning the first election will help you get going. The media marker is worth the most points at the end of the game. You will also automatically match the first two cards so you can get three party members. On the first round you get paid out $1000 per party member. Even the smaller elections are important since you can gain party membership by picking the next national cards that you favor. Getting enough early votes in a more future election may allow you to get the “most combined” votes. Especially if it is being neglected by the other players. This will allow you to exchange the area’s public opinion and fortify your position even more. Whoever wins the last two elections (keep in mind that the 7th round occurs right after the 6th with no other moves allowed) will have a huge advantage on changing and matching the national opinion. The “general” tactic is to be last player in the round. There are exceptions such as if you really need to get a media cube on the board or be first to suggest or force a coalition, but generally speaking again, you want to be last. As the money flows, it gets progressively more expensive. This is the toughest part of the game because there is no easy way to see into the future that I am aware of. You have to look at the current election and the next few rounds. Also, you always have to keep an eye out on the national board. Near the last few rounds, you will have to start weighing the national board more heavily. However, especially in the last round, it is better to match and win the election then to match the national since you can swap out any undesired national policies. Unless the national policies are locked, they can change on you quickly. Use the “Gain Votes” power of the more expensive cards in the more populous elections (more points). Votes are a quick way to participate and put you in the running even if your popularity and party policies don’t amaze the electorate. Speaking of votes, sometimes simply gaining 5 to 8 votes is worth the money on the card. Especially if you can gain a coalition with a stronger party. If you cannot beat someone by yourself, then look to forming a coalition. Getting a media cube and a national card onto the national stage will serve you in the long run. Keep a few of them in reserve for the last and critical rounds. Buying media markers are cheaper then to use a shadow cabinet card. Not only do you have to pay for the card itself, but you have to pay the other person $4000 on top of the base $4000. If you are trying to swap out a media cube, use the cheaper Shadow cards. Media markers, you want to have at least one in every election. Manage your media cubes because you only get few of them and if you win any elections, they get placed on the national board and you can’t use them. All others are released from a region after the so you will get any back that you place on the current election and don’t win. Keep in mind your only get 18, but you do get back what is on the current election after it is resolved. So if you “invest” in future elections, you may not have enough to take advantage in more current elections. If there is an election that is critical for you, make sure you either have media control of the area and/or win the opinion polls. Opinion polls can destroy the best laid plans. Contributions are easy to figure out. If you need the money take it. If you are doing fine, go for the party membership (and thus the points). A dirty trick is to swap out a media cube of someone who is most likely going to win that election. They will not be able to claim the media points for that election. This game is hard. Luck can favor you one minute and then screw you the next. Just as with real elections, you take your hits and then hit right back. Hopefully, after these tips, you don’t have that many bumps and bruises. 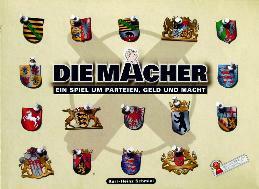 It is time to exert your power and because the DIE MACHER!!!! I have also added my last score card to give you an idea of the magnitude of the points that each category can get.